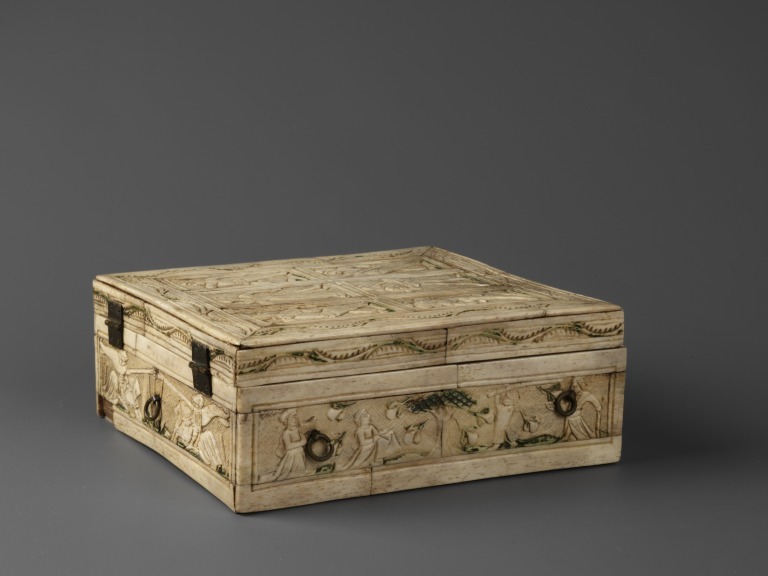 This is a bone and wood casket made in the South Netherlands in about 1440-1470. The casket is closely comaprable to V&A Mus. no. 4660-1859, although the stlye of the carvings on the lid, as well as the figure's costumes, are different and nmust be the work of another craftsman. 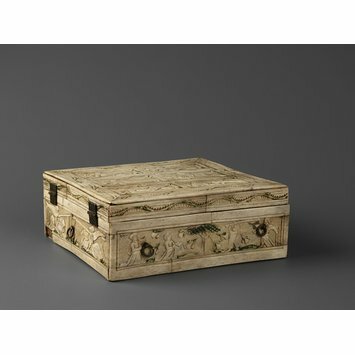 Like the latter the casket was porblably intended as a nuptial gift. Paula Nuttall has traced the history of the scene of the beating of the pear tree, which probably symbolizes fecundity and the hope for a male child (Nuttall 2010, pp. 136-38). Casket with a wooden carcase, onto which are glued multiple plaques of carved bone. The lid is framed by a border of stylized flower stems; within are six plaques depicting dancers, with three men wearing tight costumes and hats, a musician playing the pipe and tabor, a fool and a female figure wearing a turban. The dance is the moresca. The sides of the box are made up of two figurative plaques, each bordered above and below by bone framing elements. The front shows two hunters in a landscape, one with a boar spear and the other with a bow. Moving from left to right around the casket, the next face depicts hounds chasing a stag, with a hunter blowing his horn at the far right; on the back are two knights jousting (extremely similar to V&A Mus. no. 4660-1859); and the final side shows a boy beating a pear tree as a young woman catches the fruit in her skirts; another woman plays the harp while an older man looks on, holding a detached branch of the tree. The underside of the casket is inlaid with a checkerboard formed of bone and dark wood. Purchased in 1860 (£5); no furhter details in Museum records.